20 farmers in Guangxi Yulin Luo Zhu village participated in the second phase of guava relay baton project. 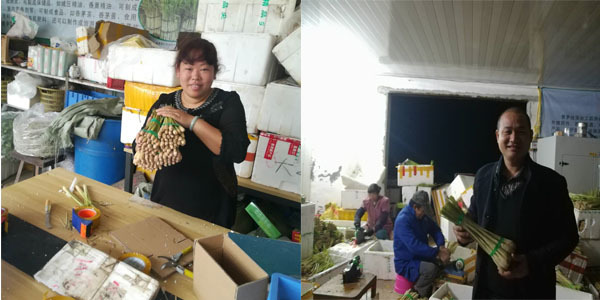 With hardworking of project director, volunteers and all the project households, the first relay baton project farmers’ annual income reached more than 60,000 yuan, out of poverty, payed back interest-free loan on time and relay the baton to the farmers of the second phase of guava relay baton project. Organic vegetable Farmers are mainly selling cauliflower, cabbage and other winter vegetables, as well as planting soybeans, eggplant and other summer vegetables. Before the Spring Festival the price of cauliflower rose from 1.5-1.4 yuan / kg, up to 3.0-3.4 yuan / kg. 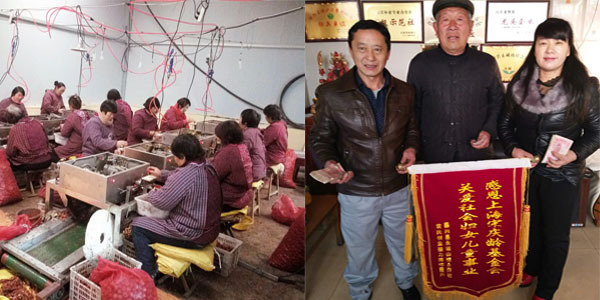 Left photo above: Project families’ children Wu Tao, Shen Rui, Wei Yuyun, as volunteers, participated in the seventh session of the Jintang County’s "Love transmission - New Year's wishes" activities before the Spring Festival. 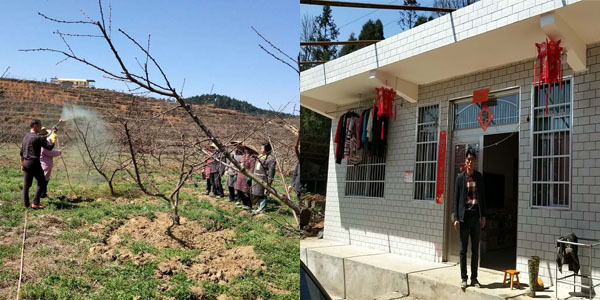 Right photo above: Project household’s farmer’s girl Su Fan’s weeding. 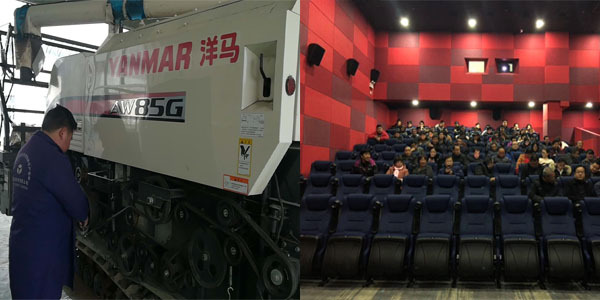 In the first quarter after the project was launched, project director and volunteers completed the distribution and verification of 1 million yuan valued materials. 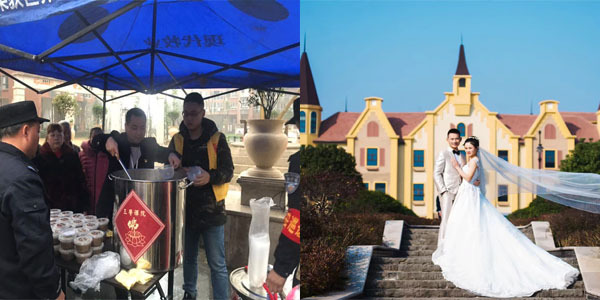 Left photo above: Project household Gao Jinhai was dressing for the wheat. 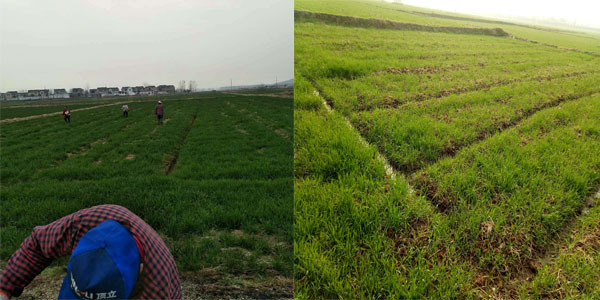 Right Photo above: The growth of wheat grown by the project household Jiang Fuming. The yield per mu of Kiwi fruit has increased by 100 kg more than last year. Through cooperative packaging and sales, the price of kiwi each kg increases 4 yuan. The project household income increased by 20,000 yuan more than last year. 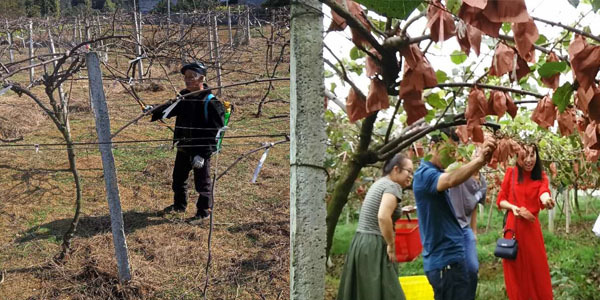 The photos above: The Scene of disinfesting insects in the orchard and picking kiwifruit. 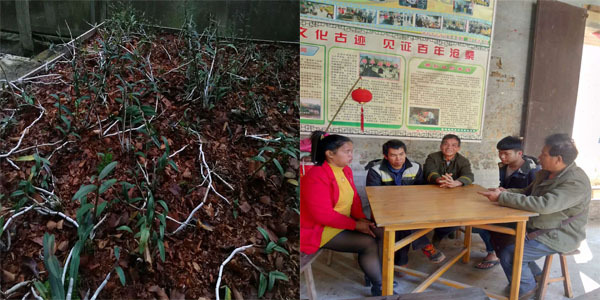 On January 22, the cooperative organized project households attend the first training session of uncaria phynchophylla planting and management. 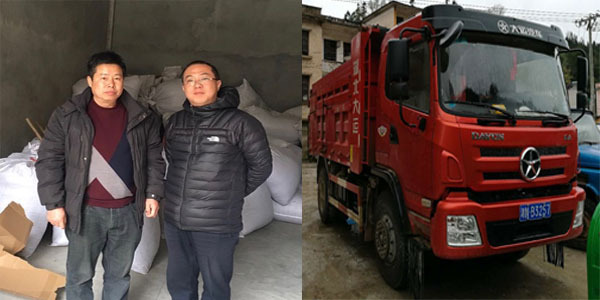 Project household Wu Xianke built a new building and Wu Xianxiang also bought a new truck. 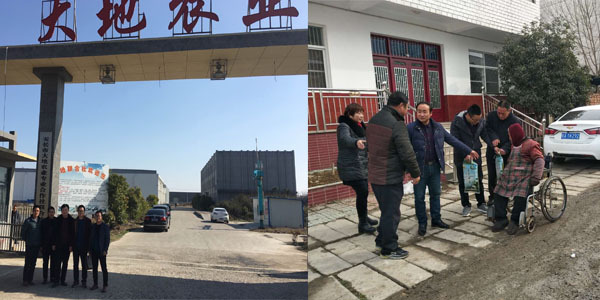 The cooperative visited the relay baton unit in Chuzhou, and its agricultural base in March. Project director Ge visited some of the cooperatives poor households during the Spring Festival. This quarter, the farmers have been weeding, fertilizing the wheat and clearing ditch drain and other work. 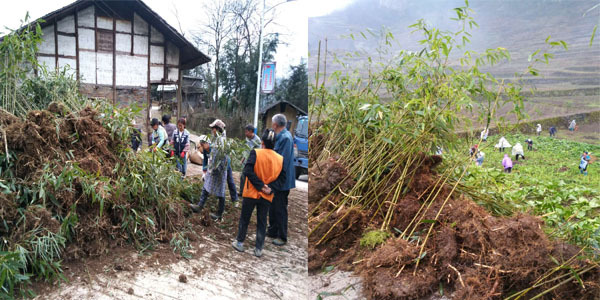 The main task for 16 farmers of project phase 2 this quarter is to plant new bamboo woodland, expanding the planting area of woodland. The children of migrant workers came back to help with growing square bamboo. Left photo above: The cooperative provided the farmers with mother bamboos. Right Photo above: .Farmers expand bamboo forest and grow new square bamboos. Right photo above: The children of project household Hong Jun, Ma Linji and Li Dan were admitted to colleges and received full tuition from the Relay Baton Fund. Three of them sent a silk banner to the foundation to express their gratitude. Left photo above: The farmers are cutting hawthorn into slices. The farmers have normal management of dendrobium, such as fertilizing, weeding and spraying water. Left photo above: The new house of the project family. Farmers are mainly engaged in filling the gaps with seedling, weeding, fertilization and other work. 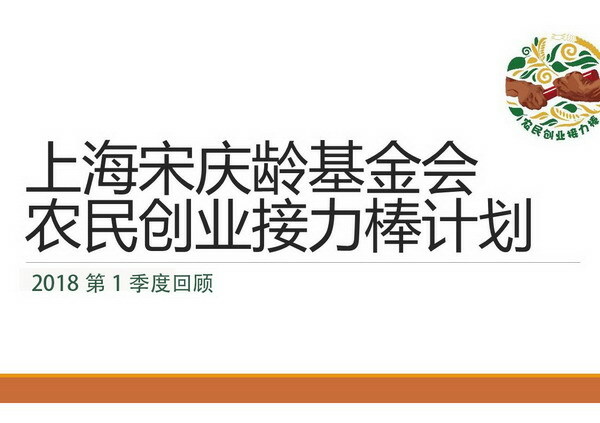 The cooperative organized farmers to participate in tea garden management seminar held by the agricultural technology department on January 25. This quarter, farmers have mainly made preparation for spring ploughing and taken part in training on agricultural machinery. In addition to picking mushrooms in the contracted greenhouse, farmers were also involved in the production of the fungus sticks this quarter. 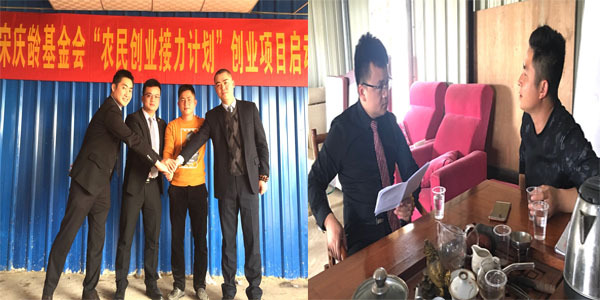 Left photo above: Project household Qin Hehui’s daughter was admitted to a college and received student grant from the relay baton fund. 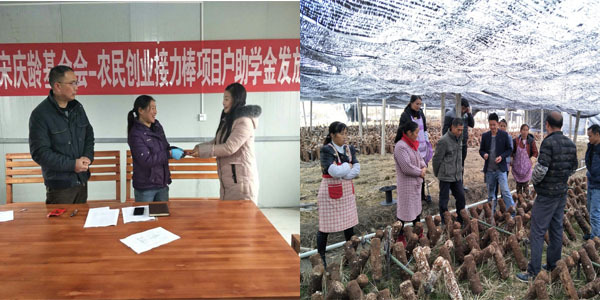 Right photo above: Give demonstration guidance to farmers who grow mushrooms. 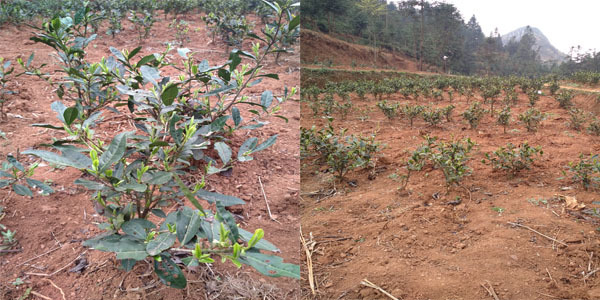 Left photo above: The farmers are fertilizing in the tea garden. 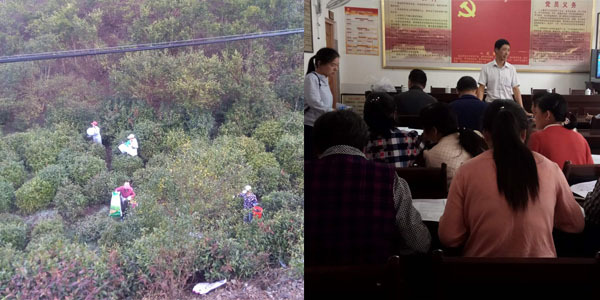 Right photo above: On February 20, the cooperatives organized farmers to participate in tea picking standard technical training. 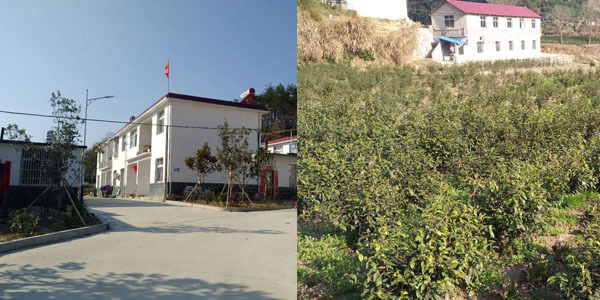 Right photo above: Project household Chen Yuanlu planted apple peach and his annul income increased. Here is his newly built house. Left photo above: On February 26, the cooperative organized 20 farmers to observe on-site operation demonstration of reasonable fertilization and pest control methods. On February 27, the cooperative organized 20 farmers to attend the training on picking and packaging citronella. This quarter is the sales season for tilapia. 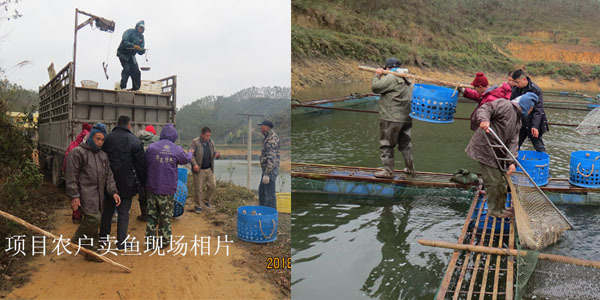 The photos above show the scene that project households are catching fish and selling fish. 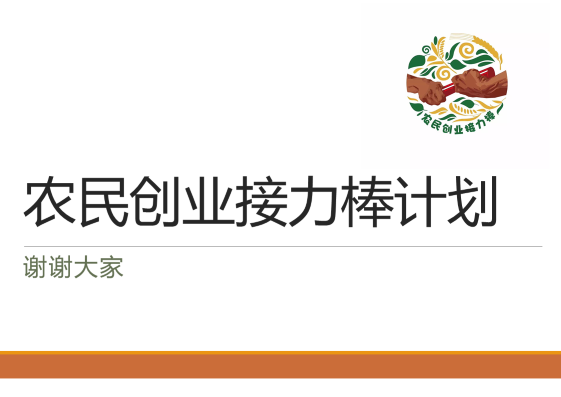 The cooperatives organize farmers to attend the training on bee spring breeding technology. 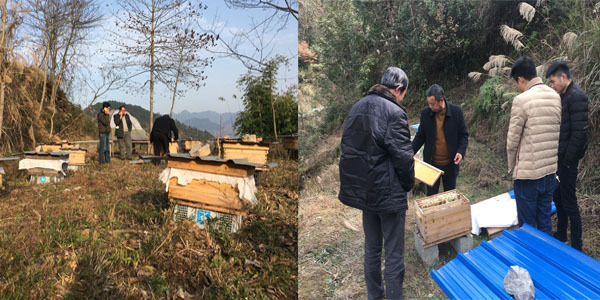 The project director guided project households Zhang Qiyue, Tian Ruijin Mai Xinfeng and Tian Yingwen to make corresponding management work for the bee wintering. 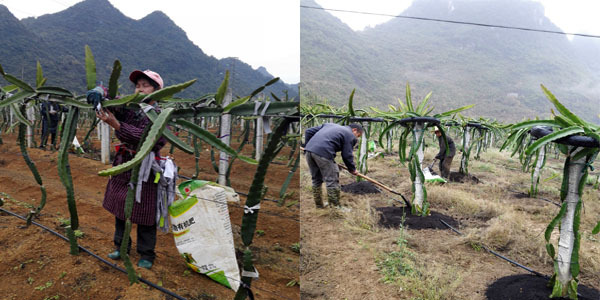 Dragon fruit project household Wei Minglu’s mother helped to tie and cut the seedlings, and his brother was fertilizing. All the other crops in the tea fields were harvested, and the farmers took care of the tea. is about 100 yuan per day. 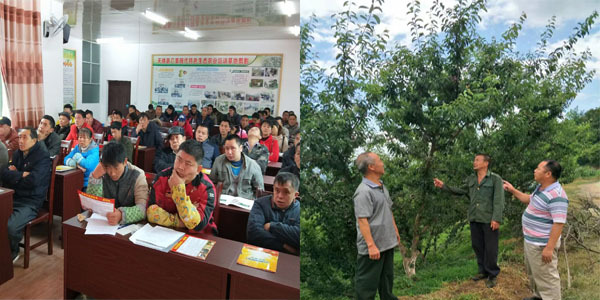 Left photo above: 12 farmers participated in the training on the winter fruit tree management. Right photo above: Project households Mo Wenfu and Jiang Shizhong and Project Director Yang exchange planting experience.